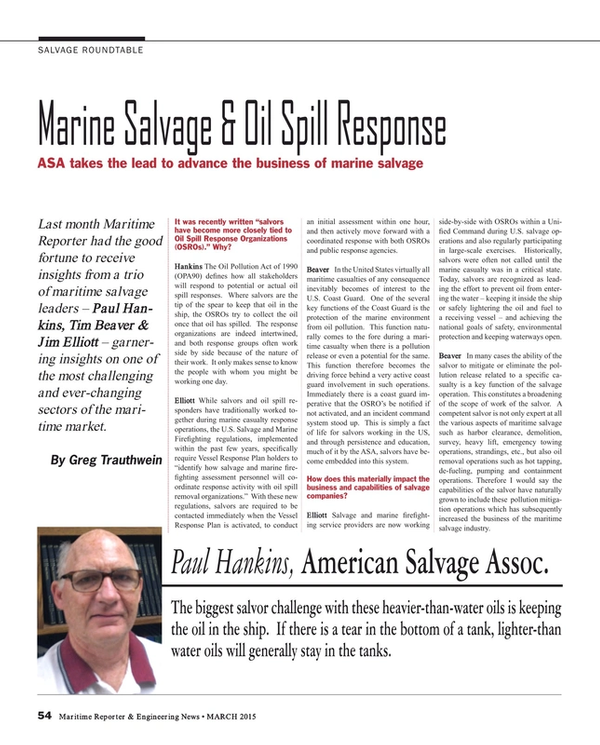 Last month Maritime Reporter had the good fortune to receive insights from a trio of maritime salvage leaders – Paul Hankins, Tim Beaver & Jim Elliott – garnering insights on one of the most challenging and ever-changing sectors of the maritime market. It was recently written “salvors have become more closely tied to Oil Spill Response Organizations (OSROs).” Why? Hankins The Oil Pollution Act of 1990 (OPA90) defines how all stakeholders will respond to potential or actual oil spill responses. Where salvors are the tip of the spear to keep that oil in the ship, the OSROs try to collect the oil once that oil has spilled. The response organizations are indeed intertwined, and both response groups often work side by side because of the nature of their work. It only makes sense to know the people with whom you might be working one day. Elliott While salvors and oil spill responders have traditionally worked together during marine casualty response operations, the U.S. Salvage and Marine Firefighting regulations, implemented within the past few years, specifically require Vessel Response Plan holders to “identify how salvage and marine firefighting assessment personnel will coordinate response activity with oil spill removal organizations.” With these new regulations, salvors are required to be contacted immediately when the Vessel Response Plan is activated, to conduct an initial assessment within one hour, and then actively move forward with a coordinated response with both OSROs and public response agencies. Beaver In the United States virtually all maritime casualties of any consequence inevitably becomes of interest to the U.S. Coast Guard. One of the several key functions of the Coast Guard is the protection of the marine environment from oil pollution. This function naturally comes to the fore during a maritime casualty when there is a pollution release or even a potential for the same. This function therefore becomes the driving force behind a very active coast guard involvement in such operations. Immediately there is a coast guard imperative that the OSRO’s be notified if not activated, and an incident command system stood up. This is simply a fact of life for salvors working in the US, and through persistence and education, much of it by the ASA, salvors have become embedded into this system. How does this materially impact the business and capabilities of salvage companies? Elliott Salvage and marine firefighting service providers are now working side-by-side with OSROs within a Unified Command during U.S. salvage operations and also regularly participating in large-scale exercises. Historically, salvors were often not called until the marine casualty was in a critical state. Today, salvors are recognized as leading the effort to prevent oil from entering the water – keeping it inside the ship or safely lightering the oil and fuel to a receiving vessel – and achieving the national goals of safety, environmental protection and keeping waterways open. Beaver In many cases the ability of the salvor to mitigate or eliminate the pollution release related to a specific casualty is a key function of the salvage operation. This constitutes a broadening of the scope of work of the salvor. A competent salvor is not only expert at all the various aspects of maritime salvage such as harbor clearance, demolition, survey, heavy lift, emergency towing operations, strandings, etc., but also oil removal operations such as hot tapping, de-fueling, pumping and containment operations. Therefore I would say the capabilities of the salvor have naturally grown to include these pollution mitigation operations which has subsequently increased the business of the maritime salvage industry. Oil in the water is always a major concern in casualties and salvage operations. Briefly describe any new or specific concerns for the ship owner today. Elliott Given the current record on Vessel Response Plan activations, ship owner’s should recognize the benefit of contracting a qualified salvor immediately upon notification of a marine casualty. Unfortunately, once oil enters the water, it is a losing battle since, even with the latest technology, typically OSROs cannot clean-up more than 10 to 25% of the spilled oil. Beaver There is the relatively new upswing in the use of LNG for fuel aboard ferry boats and cargo vessels in the marine transportation industry. It will interesting to see how the salvage industry responds to this. Hankins The difference between the salvor and other responders is an important one. The salvor’s primary goal in the environmental response part of the salvage triad (protecting people, property, and environment) is nearly always keeping the oil in the ship or offloaded safely to another vessel. If we are effective at that, the OSRO fortunately (from an environmental perspective) becomes unnecessary. So the more oil that is kept in the ship (100% recovery rate), the less will be spilled to the environment (on water oil recovery generally is 10-50% of the amount spilled). If anything, the ship owner should be less concerned. We are more ready to respond now than ever and more in tune with the organizations meant to oversee that response. We noted with interest a recent article in your ASA magazine on the Response Challenges with non-buoyant oils. Please describe the challenge from the salvor perspective? Hankins The biggest salvor challenge with these heavier-than-water oils is keeping the oil in the ship. If there is a tear in the bottom of a tank, lighter than water oils will generally stay in the tanks. They simply can’t sink through the water pressing on the tank tear. On the other hand, if the oil is heavier-than-water, the oil will sink immediately through the water column, potentially emptying the contents of a tank. Elliot Bottom line: Whether the oil floats or sinks, the salvor should be the first call to keep the oil inside the ship or to safely lighter the stricken ship to a receiving vessel. How do you invest to meet this challenge? Beaver The salvage industry generally carries in house diving capability, or has a well respected and capable sub sea contractor available to tackle the removal of non-buoyant oils. It is doubtful that this wheel needs re-inventing or duplicating at this time, however the experience level of the salvor or sub sea contractor needs to be closely considered. Hankins Fortunately the problem isn’t wide-spread. As we all know, most ships these days operate using lighter-than-water fuels. The main challenge comes with those tankers that transport heavier type oils and asphalts. The problem is two-fold – the water depth and the ability to pump to the surface. Neither problem is particularly complex, just time consuming. Elliott The salvage industry continues to make advances in both subsea oil detection and recovery. For example, as part of the subsurface effort to locate oil in the wake of the Deepwater Horizon event, T&T Salvage in association with Braveheart Shipping developed a multi-beam echosounder system to detect oil in the water column and on the sea floor. In contrast to the systems used on historical submerged oil response operations, data and imagery is now interpreted in real-time by onboard technicians facilitating the immediate direction of tactical assets to recover submerged oil. For submerged oil recovery, ASA members also continue to develop new technology to better recover submerged oil. For example, Marine Pollution Control has developed a two-person submarine fitted with an underwater suction nozzle. The submersible unit houses a pilot and one operator in a spherical acrylic cabin to provide visibility in all directions. The system is also capable of hovering over the surface to minimize disturbing the oil impacted area. The American Pollution Control Corporation (AMPOL) developed the “Oil Stop Bottom Oil Recovery System” (OSBORS) submerged oil recovery system, developed in coordination with Coast Guard Research and Development, a remote controlled track-driven dredging vehicle designed to remove oil that has settled on the bottom. T&T Marine Salvage also developed a shallow-water dredging system for near shore and inland submerged oil recovery operations. These systems dredge the oil and discharge the pollutants into top-side support equipment for separating recovered oil and in-situ treating of water and solids. The Arctic: Though energy markets are stalled, invariably exploration and production activity will pick up in the future as prices rebound, even in high-cost, technically challenging environments such as the Arctic. Looking at the Arctic from both a salvage/operations and in terms of oil spill recovery, what do you count as the greatest challenge(s)? Beaver There needs to be investment made in techniques and equipment that is particularly designed for arctic conditions. Taking the experience from the GoM and transplanting it to the much different and often harsh arctic north will lead to very long learning curve. Taking the experience of others working in theses extreme environments as well as supporting research and design of best in class, fit for purpose salvage and response equipment seems to me to be a much better approach. That being said, probably the biggest challenge to working in the arctic for salvage and oil spill response is the lack of infrastructure in this vast area. There is a lack of airports, deep water ports, communication facilities and support services makes any efforts much more difficult. Development of the resource will need to include the development of this infrastructure. Hankins From a salvors perspective, it’s remoteness and ice. Either one is a challenge but combined they make for a nearly impossible response. And again, neither is particularly technologically challenging, it just takes a lot of resources and commitment. One has to go with his entire toolbox. Looking at the ASA agenda for 2015 and beyond, what is on top? Hankins The ASA’s top three objectives this year remain relatively U.S-centric, but with implications that go well beyond the U.S. borders. Those issues are (1) the insertion of a responder immunity clause in the Oil Pollution Act of 1990; (2) Coordination with Coast Guard and other relevant agencies on the development of a salvage exercise program; and (3) Ensuring the existing salvage regulations are adequately enforced when a vessel is placed at risk through some peril to the ship, its crew, or cargo.